The Craft Building is exclusively let to INTO students. This newly refurbished accommodation is conveniently located near to Aldgate East underground station in zone 1, with easy links to all major London universities. Prices for the 2018/19 academic year are available on request from INTO. All rent payments are made directly to INTO. Please contact your INTO representative for more information. Free broadband in your bedroom means you're always connected. The Craft Building is exclusively let to INTO students.This is a great base from where you can make the most of your London Student life. 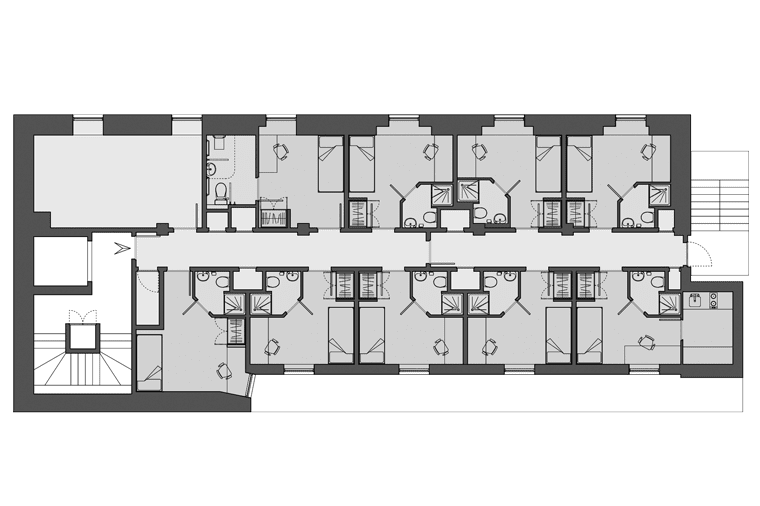 The accommodation is located a short walk from Aldgate East underground station, and there are great bus links, so you can be anywhere in the city in no time! Our newly refurbished site offers en-suite rooms arranged in flats for eight people. All rooms have a broadband connection and there is also Wi-Fi throughout the building. Each flat has a shared kitchen and dining area, perfect for catching up with your flat mates. This area is cleaned for you on a weekly basis so that's one less thing for you to worry about. We also have self-contained studios available. The building has great security features including fob entry system for the building and key access to the flats and rooms. There are also CCTV cameras in and around the building. The site offers an on-site laundry and bike storage facilities so you will have everything you need on your doorstep. The Craft Building is managed by the team at Don Gratton House which is situated around the corner at 82 Old Montague Street and has 24 hour staff presence. There is a vibrant atmosphere in this part of East London with some of the most renowned restaurants and bars in nearby Brick Lane. Brick Lane also plays host to a large street market on Sundays which draws crowds of bargain-hunters from all over London. Definitely worth a visit! The nearest underground station to The Craft Building is Aldgate East, which is served by the District and Hammersmith & City lines. The Craft Building is within Zone 1 of the underground, offering convenient travel to all of London's top city centre destinations. The Craft Building is let directly to INTO students only. If you are studying with INTO and would like to apply for accommodation in the Craft Building please contact INTO. For check in you will need to bring ID and a copy of your offer letter/email. As booking fees and rent instalments are managed by INTO, we are not able to process any refunds. You should report any cancellations directly to INTO. The Sample License to Occupy (PDF 356KB) is available to download with details of the terms and conditions of your contract with us. The Craft Building now benefits from LaundryView which will make doing your laundry on-site even easier. The system, created by Circuit, allows you to go online and check the availability of washers and dryers in your building as well as see when other washes are about to end. If you wish to bring a car to London you will need to apply for a residents' parking permit through Tower Hamlets Borough Council and park on the streets surrounding The Craft Building.